Gamesa G10X-4.5 MW wind turbine. The Gamesa G10X is a 4.5 megawatt wind turbine with a rotor diameter of 128 meters, equivalent to the length of a soccer field, capable of generating enough electricity to power 3,169 households for a year, replace nearly 1,000 tonnes of petroleum equivalent (TPE)annually and avoid 6,750 tonnes of atmospheric CO2 emissions per year. Its innovative modular design features two-sectioned blades for easy transport and installation and a coupled crane system to simplify assembly and dismantling tasks. The new blade profiles has been designed to reduce aerodynamic noise and maximise output. The drive train consists of a semi-integrated main shaft and a two-stage gearbox with no high-speed rotating components. The electrical system uses a permanent magnet synchronous generator and a full converter to comply with the most demanding grid connection regulations. 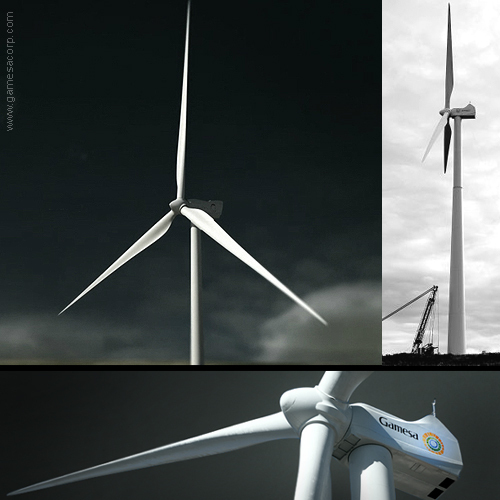 *Read about Gamesa wind turbines manufacturing and assembly process. Materials: Tower: concrete and steel - Blades: organic matrix composite reinforced with fiber glass or carbon fiber.